KAREN CHRISTINE PATRICK: FREE BOOK!!! "WEIRD SHOULDN'T STARVE: A Basic Income to Support Free Speech About Fringe Topics"
FREE BOOK!!! "WEIRD SHOULDN'T STARVE: A Basic Income to Support Free Speech About Fringe Topics"
Get ebook "Weird Shouldn't Starve"
INTRODUCTION: The idea of a Basic Income has been percolating into the mainstream as an idea to change the discussion about economics from “top-down” discussions that don’t seem to resonate at the level where most of us live. Also, we are now aware of threats to true democracy from wealth inequality, threats to free speech and civil discourse from social media wedded to clandestine surveillance. The “stick” in the “carrot and stick” social engineering going on, so subtle most people don’t realize it until they begin to question the status-quo, is that financial assassination is possible because we do not have a floor to poverty. As long as people can fall completely “down and out” financially, the idea of free speech on any topic is under threat. This book gives an overview on how the idea of a Basic Income would support those who want to have open discussions about many fringe topics, UFOs, Exopolitics, Psychic Abilities, Conspiracies, Ancient Tech, Space Anomalies, Ghosts, Whistleblower Testimony, etc. The Basic Income can remove the threat of financial terrorism for speaking out or exploring these and other topics. Karen Christine Patrick is an experiencer, contactee, psychic and researcher. Karen worked as a technical writer the high-tech field for 20 years, doing contract work for Intel, Microsoft, Epson and other companies. She was a full-time caregiver for her daughter with Spina Bifida. Spreaker. She an organizer of the MarsAnomaly Conference.com, an event in Silver City, New Mexico where she resides with her family. Karen is an advocate for the Basic Income for marginalized people, the disabled, unpaid caregivers, domestic violence survivors, people in transitional life circumstances, and all aspects of the fringe, contactees, abductees, and experiencers. She is the admin for the group Caregivers for a Basic Income on Facebook, and is active on Twitter for "Basic Income New Mexico." This website has lots of information plus updates on Basic Income trials from all over the world. Guy Standing is a primary source about Basic Income from academia. He conducted the U.N. Test of a Basic Income in India with successful results. civilization to gets its act together in the 21st century. Moderator of /r/BasicIncome on Reddit. Medium member since Jun 2017 . 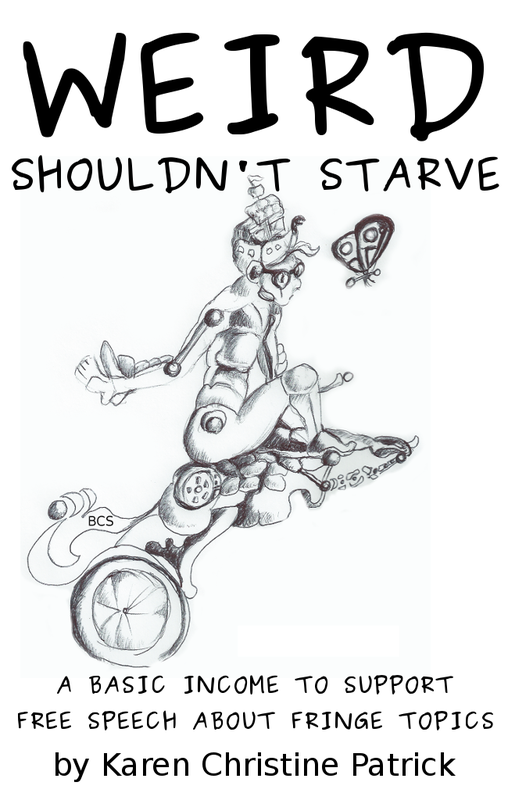 The author of this book "Weird Shouldn't Starve," Karen Christine Patrick, talks about the Basic Income, on Twitter, as an initiative for solving wealth inequality in New Mexico, a state with a rich history in the UFO topic.